NEUTRALISES THE EFFECTS OF RADIATION EMITTED BY MOBILE PHONES. 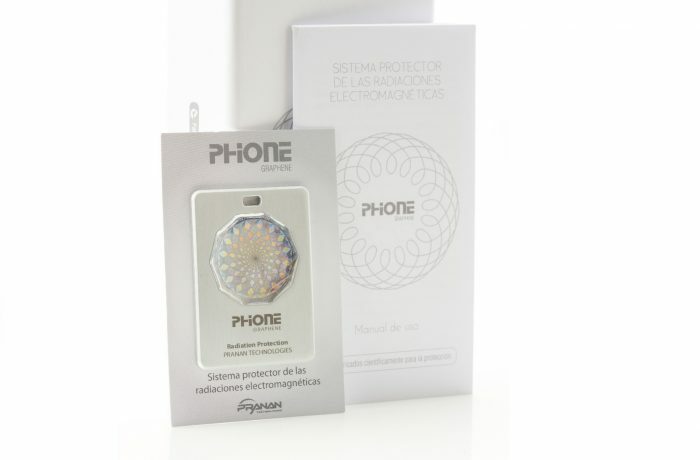 PHIONE Graphene is a device that protects us from electromagnetic radiation and radiation emitted from mobile phones (including the latest models) during phone calls or when switched on. Protects us from harmful radiation emitted by mobile or wireless phones, including the latest models. Does not affect the performance of the phone. Protects us when the mobile is switched on and during phone calls. The device automatically starts working when the mobile is switched on. When we change mobiles, it be switched over and used with the new one. Easily attached to the back of the mobile or can be worn as a pendant around the neck. The device starts working automatically when it comes into contact with electromagnetic radiation. Dimensions: 1.42 x 2.05 x 0.08 in. Service life of the device: Continues to work if kept in perfect condition.